A close-up of spidery witch-hazel blossoms, the last flowers of fall in Westborough's woods. As Halloween approaches, when the autumn leaves are finally down and branches are mostly bare, one last flower graces the woods--the spidery yellow blossoms of the witch-hazel tree. The name witch-hazel has nothing to do with witches, even though the tree usually blooms in the weeks just before Halloween, not in the spring like most other trees. The "witch" in the name comes from "wych," an old English word for branches that bend easily. Such branches were traditionally used by people known as dowsers in searching for water or minerals. Many of us still associate witch-hazel with the forked divining rods that supposedly helped people to find water under ground in days of old. Or we think of witch-hazel as an old-fashioned skin lotion. Both were uses for common witch-hazel (Hamamelis virginiana ), a small native tree that grows in Westborough's moist woods and throughout the eastern United States. For most of the year witch-hazel seems like just another shrubby tree, but it's noticeable at this time of year because of the small blossoms on its bare branches. It's beautiful on a bright fall day when the sunlight filters through the blossoms in a stand of the trees. If you sniff the blossoms, you might detect a subtle spicy fragrance. Earlier in the year, you can identify witch-hazel by its leaves, which are unusual because they are lopsided at their base. Otherwise they are round with wavy edges. The leaves turn yellow in the fall. You can enjoy witch-hazel in places such as the Bowman Conservation Area and the Headwaters Conservation Area (Andrews-Nourse). Stroll along trails that pass near water and stay on the lookout for the yellow flowers, which are about an inch wide. A walk in the town's wooded Libbey property off Adams Street will also take you through unspoiled areas filled with witch-hazel. Follow the main the trail from Adams Street as it makes a large loop about a mile and a half long. For a longer walk, take the Wile Forest loop trail from Carroll Drive, cross over to the Libbey loop, and return to Carroll Drive on the Wile forest loop. The combined Wile and Libbey loops make a walk of about two and a half miles. Although witch-hazel blooms in the fall after shedding its leaves, the resulting seeds need nearly a year to mature. They ripen the following August and September, just before a new round of October blossoms. When the seeds are ready, the drying seed capsules explode, sometimes with a pop, shooting the seeds up to 30 feet away. For this reason, the tree is sometimes called snapping hazel. The shiny black seeds are food for various animals that we have in Westborough, including deer, rabbits, beaver, and ruffed groused. Some Native American groups also ate the seeds, which reportedly taste like pistachios. In spite of what the name might suggest, witch-hazel seeds are not a type of hazelnut. 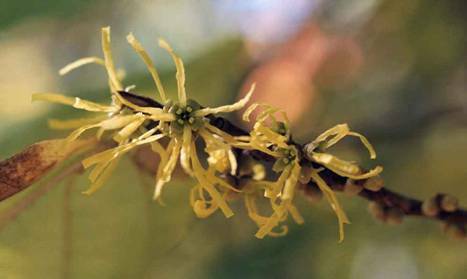 Witch-hazel's medicinal uses originated with Native Americans and continue to this day. A witch-hazel extract was first marketed as a patent medicine in the mid-1800s. Today witch-hazel is one of a few medicinal plants approved by the Food and Drug Administration as an ingredient in non-prescription drugs. You can buy over-the-counter "witch-hazel" at local pharmacies for external use on minor cuts, insect bites, and poison ivy. Witch-hazel extracts are made from the bark and twigs of the tree. In this country, a distilled extract is used in after-shave lotions, deodorants, soaps, pads for soothing hemorrhoids, and other personal products. In Germany, an alcohol extract is approved for treating varicose veins. The American witch-hazel industry is located mainly in Connecticut. Most of the the witch-hazel trees used in this industry come from New England, especially northwestern Connecticut.